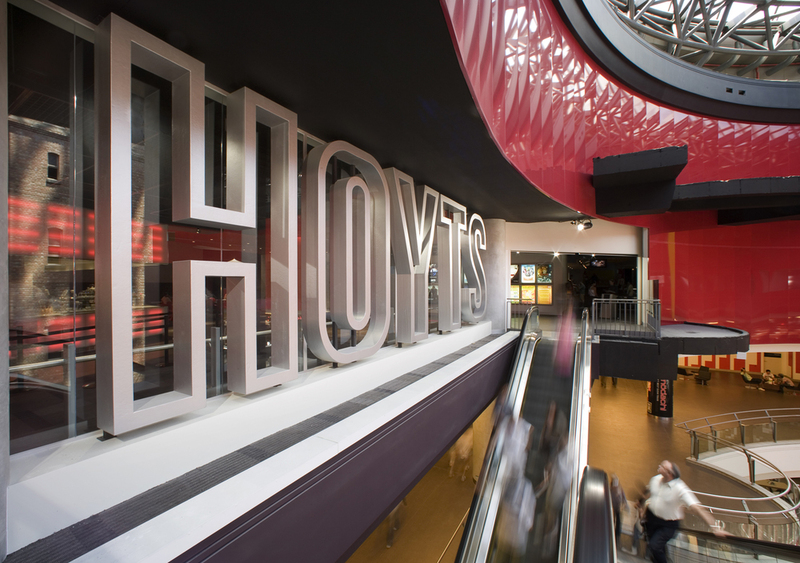 The new cinema complex at Melbourne Central, a shopping centre in Melbourne's CBD, has been designed to bring the experience of cinema out into the public, to get cinema out of the box and in front of potential cinema patrons and to create social spaces that are engaging and welcoming, to create a richer more varied experience and a better event. One idea is about exploiting contemporary technology to expand the cinema experience, the other is about the significance of hospitality. The power of light frames both the possibility of cinema and the contemporary city. The electric city and cinema were born at the same time and live an overlapping existence. Electric light illuminates the city to create our urban lifestyle and cinema has become an indelible frame for seeing that city. Cinema thus acts as a cultural map and a mirror. It reflects the presence of the surrounding communities and their current and past attitudes, memories and ideas. Australia has a very rich, diverse and heterogeneous population. We wanted this to be reflected in the experience of going to the cinema. The cinema can reflect the nature of film as a microcosm of the society around it. Like the hero of Jean Cocteau's groundbreaking film, Orphee, Blood of the poet, made in1950, with film we walk through a mirror of our world to a world of dreams and fantasies that are a reflection of our own world.The interior has been conceived of as an urban environment made up of discrete experiences and destinations. It is not a homogeneous and predicable experience. Its an adventure. Each time you go you can treat yourself to a different experience. You are not always in the same mood or with the same people with the same expectations so this space can be used in different ways. A night at the movies can be a big night with a large group of friends or family or it can be intimate and sophisticated. 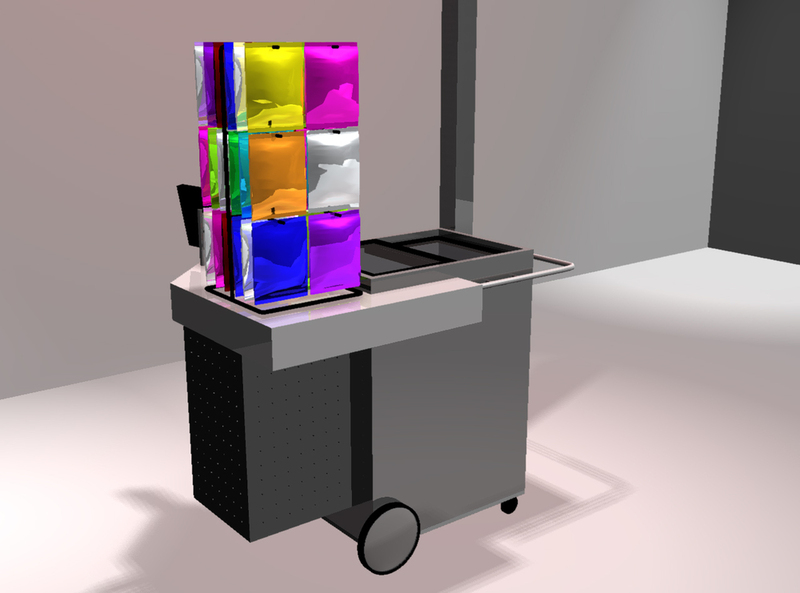 This is space as equipment for entertainment with a range of choices left in the hands of the users.The new design elements begin at the ticket box. In the public spaces and queuing zone in front of the ticket box users are greeted by interactive display touch-screens. 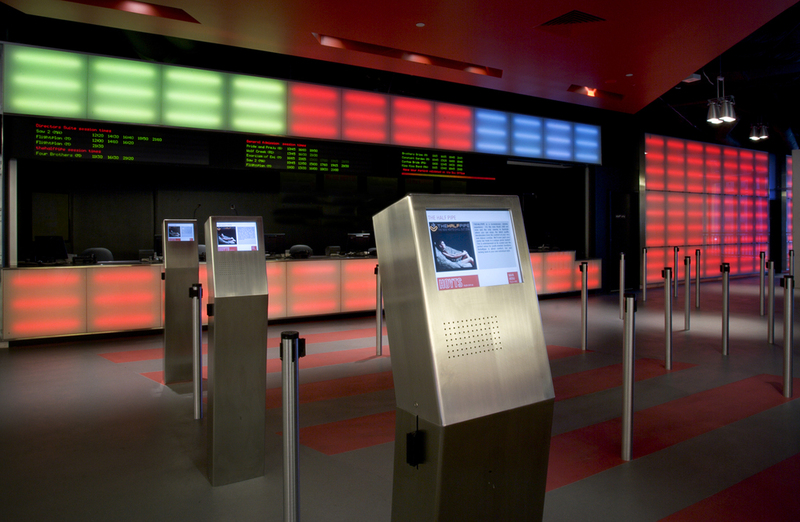 These screens are designed to provide information about films, exhibition times, information about special offers and a tantalising rush of movie trailers. 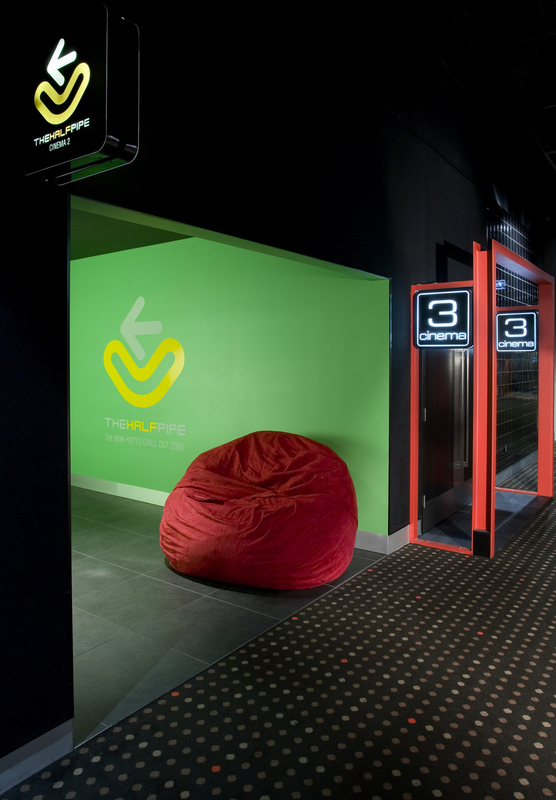 Traditionally cinema foyers are static and empty spaces. That's crazy. Such a fantastic ever-changing menu of films and with their million dollar promotional trailers should be driving the cinema environment from the moment of entry. Cinema is a dynamic cultural feast. We go to experience new things. 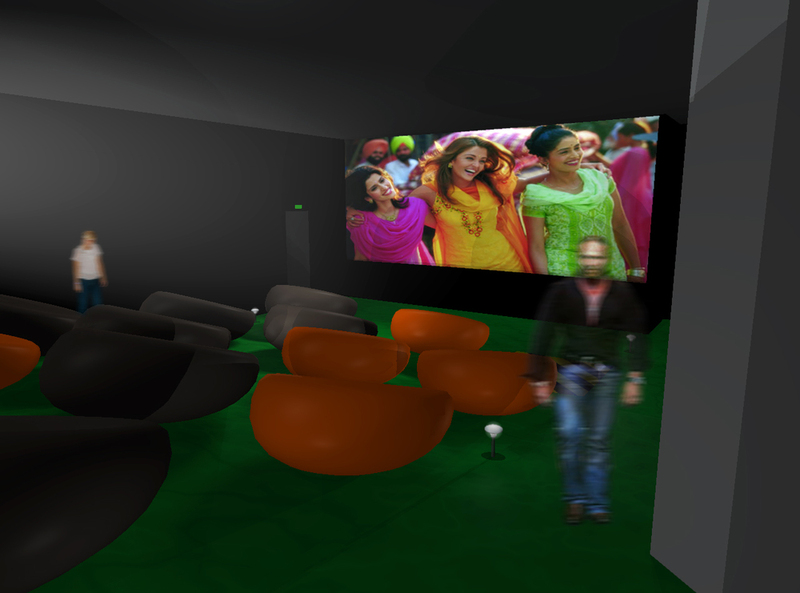 We felt the cinema space should capitalise on and exploit this dimension. We wanted the building to be a kind of software, a programmable space, a changeable space that embraced contemporary technology in order to celebrate the drama of cinema. This was our recognition of the legacy of Broadway. So is the drama of the new release, the anticipation of a new experience. We wanted to capture the seasons of the cinema, changing the cinema experience at different times of the day and year and also reflecting the mood and thrill of the changing menu of new releases. 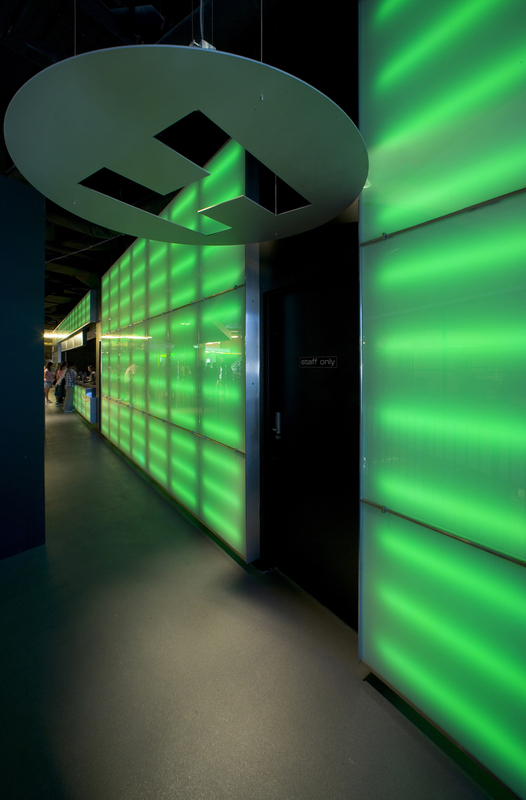 We have further addressed this by treating a number of the principal internal wall surfaces as programmable electronic canvases, able to change colour and mood in response to the changes in content and patron expectation. The ticket box is skinned with a 30 metre long computer controlled LED light wall. 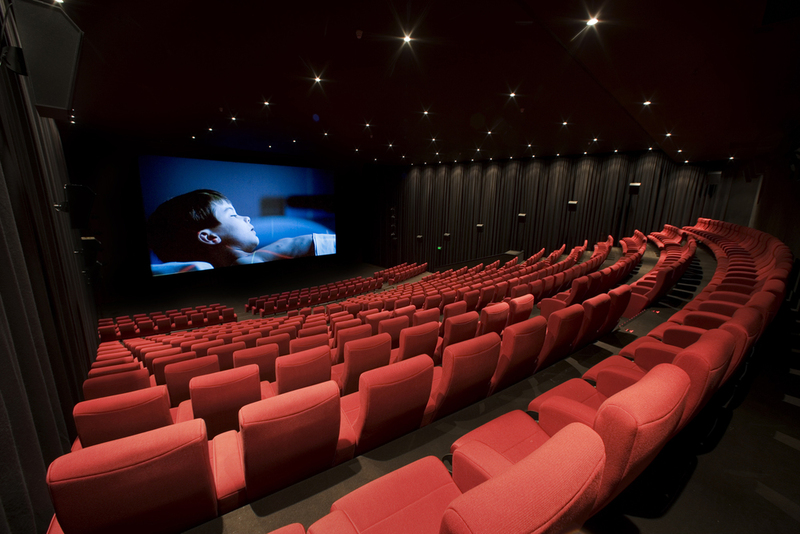 The wall is programmed to change the ambience throughout the day and to respond to the different movie menus on offer. A cinema needs a very different ambience at 10am on Tuesday from that at 8pm on Saturday night. 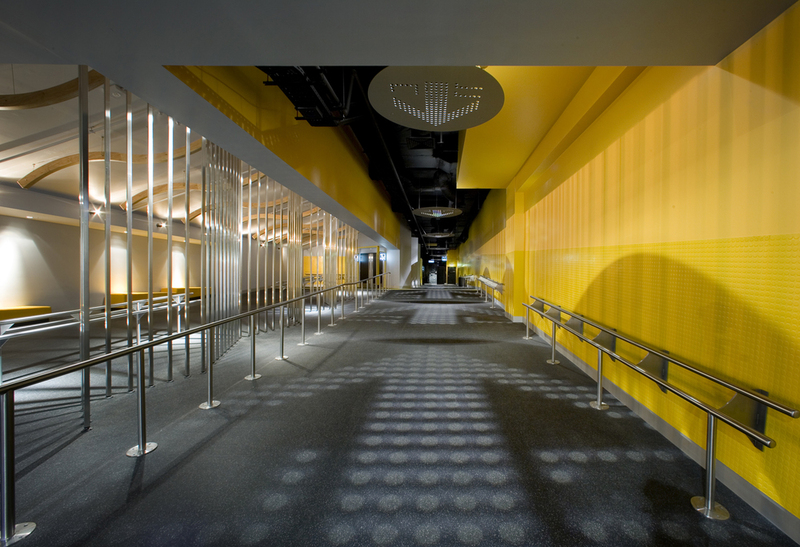 The walls have been programmed to run on a cycle that subtly changes throughout the day. Light becomes a key actor in dynamically framing the ambience from a chilled experience to the frenetic one. Every two weeks the cinema is a different place, transformed by the films being shown. Imagine if restaurants did this! For us the 'intelligent wall' or programmable surface is a new spatial or architectural interface; framing, activating and energising city spaces and interior spaces. The intelligent wall is a fusing of new computer mediated communication technologies with architecture to create a mixed reality. It is a child of a cinematic vision and cinematic techniques. 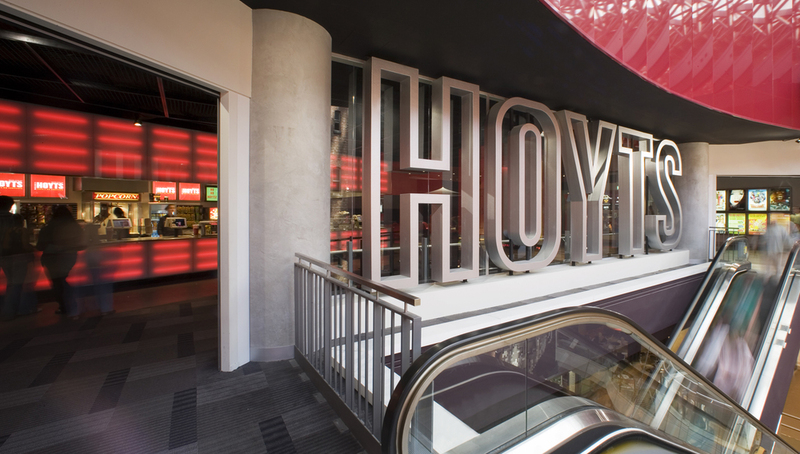 At the entry to the main cinemas, foyer and lounge level the cinema logo has been designed as an architectural screen, both a massive sign to be seen from the adjoining public multi-storey void and a see-through filter connecting the foyer to the great atrium in the shopping centre. The historic tower preserved at it's centre is seen as the site of large public events. In pursuit of the destination we have created intense zones, each with a singular feature like the wrap around stacks of back-lit poster boxes. These are luscious menus. Film is by its very nature is voyeuristic. It challenges our notions of public and private. The power and seduction of voyeurism to intrigue people is very strong, inviting in people's imagination and emotional participation. 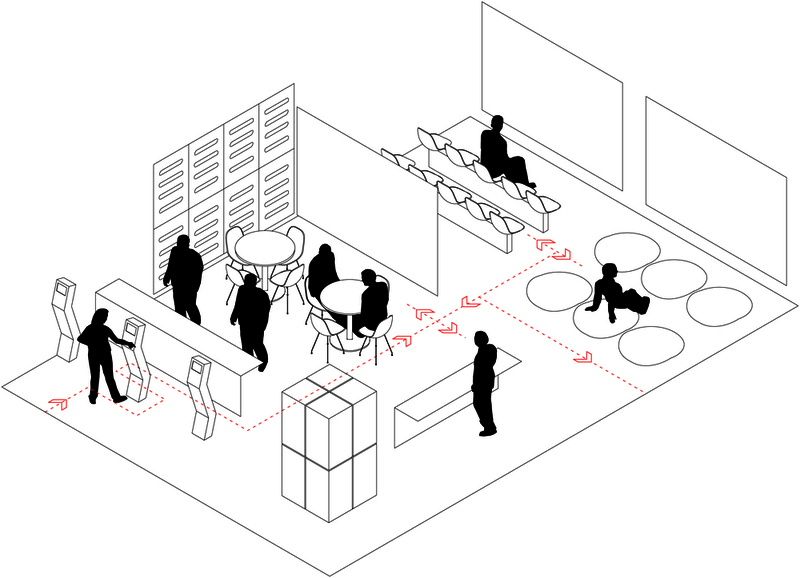 The framing of public and semi-private space within commercial precincts gives us the option of reinvigorating those spaces, seeking a sense of voyeurism, adventure and discovery. Cinema is social, on a grand public scale. It's an event. Like the opera it can be as much about other people and other activities, like the passegiare, that happen to converge at the theatre. Cinema is about catering for people together. Cinema is hospitality. The richness of the collective social experience is central. Within the foyer the candy bar is again wrapped in a programmable LED skin. 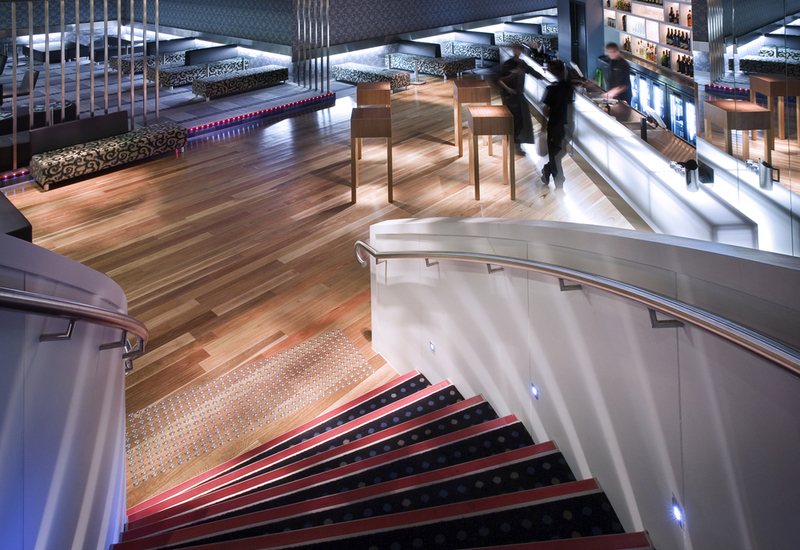 The candy bar folds around from the foyer to a lounge that is in fact a fully functioning cinema, open to the foyer. 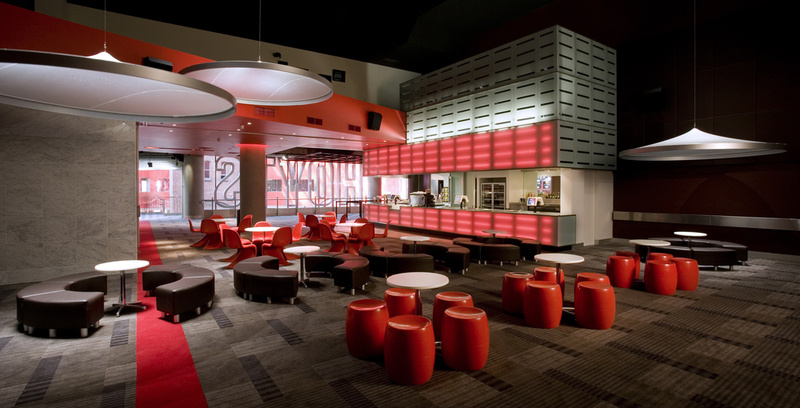 This lounge allows patrons to come into the cinema complex and see trailers before buying a ticket and it is a unique bar cafe space where the whole feeling of the space is transformed by information from the large format cinema screen. 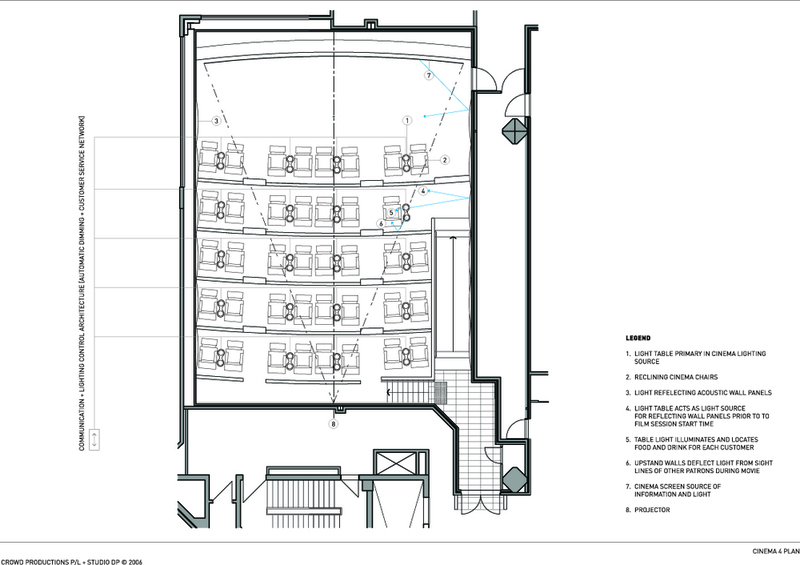 The double height Cinema-bar lounge space gives us a surprising and grand hospitality space. 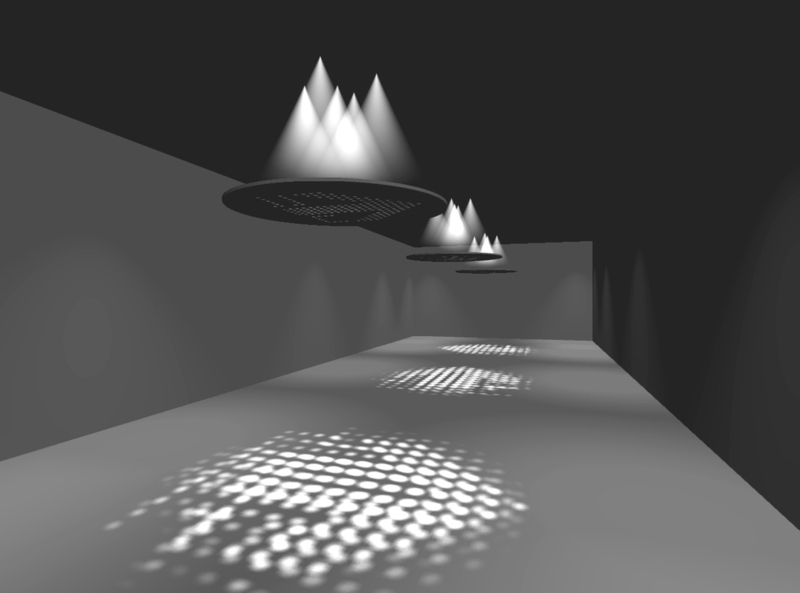 Pendant lighting from the ceiling creates intimate moments within this large void. Through this facility we want to find new ways of entertaining cinema patrons while exploiting systems of cinema projection. The whole lounge space can be closed off and then the entry is through a marble box on set to the side. 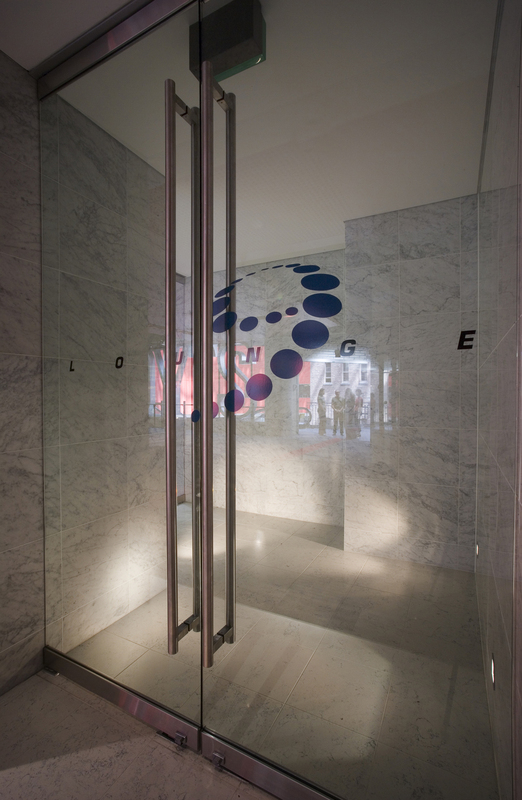 When the lounge is closed using a translucent operable wall for special functions the entry point becomes ceremonial.The cinema boxes have been divided up into different zones or destinations each with their own unique experience. They are the East End, thehalfpipe and Directors Suite. The public space at the East End of the cinema complex announces the very big cinema screens. It is designed with the industrial functionalism of a freeway. These spaces get their colours, graphics and sense of speed from freeway signage. Freeways to us are part of Melbourne's suburban growth, where most of us live. We wanted to link the energy of the rapid suburban transit to the block buster movie launch. 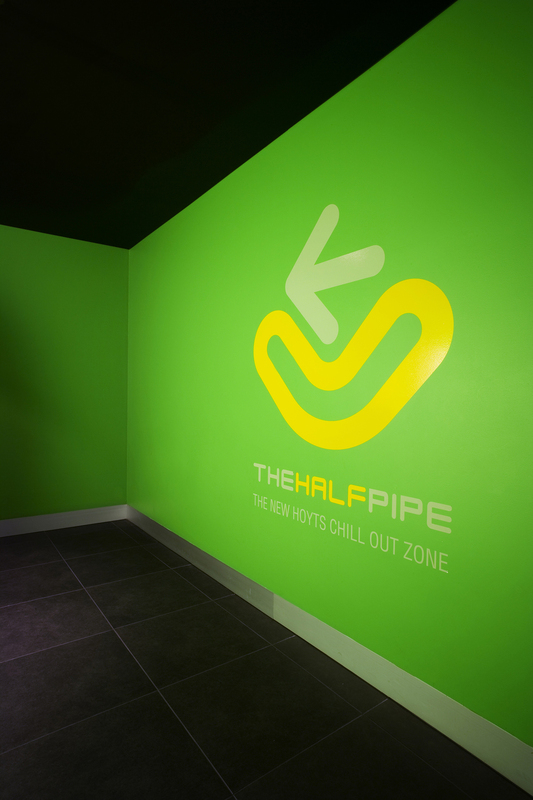 Thehalfpipe is on the menu to give patrons a different way of engaging with cinema: on your own bean bag on a skateboard ramp covered with a lawn in front of the big screen. It is chill out cinema. Layback luxury inspired by the local skateboard park and the great Australian back yard. 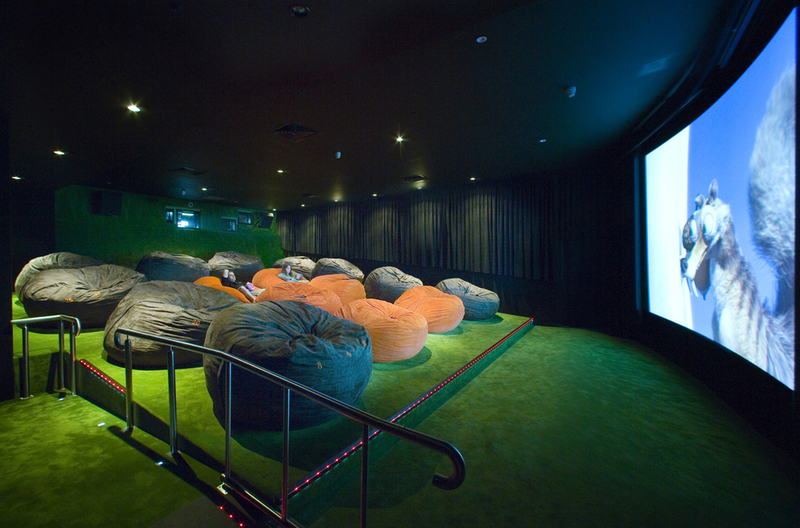 It has already achieved cult status with Melbourne's inner city cinema goers. The Directors Suite is the most sophisticated cinema offer. The seats are leather. The food has been designed with Melbourne¹s best restaurants in mind and the bar reflects contemporary hospitality trends. The industrial baroque interior combines motifs of classical luxury, like the spiral staircase that plunges down into the lounge, with gritty details from the modern city like the laser cut Gobo-chandeliers and the stainless steel bump rails protecting the English wallpaper. 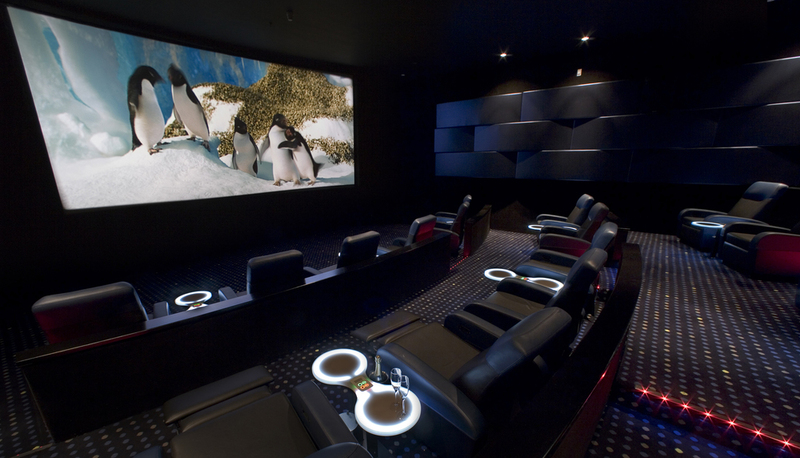 Guests come here to combine privacy, comfort and the luxury of fine food with a good movie. It designed to maximise the sense of escape, more like a private club or a cigar bar. 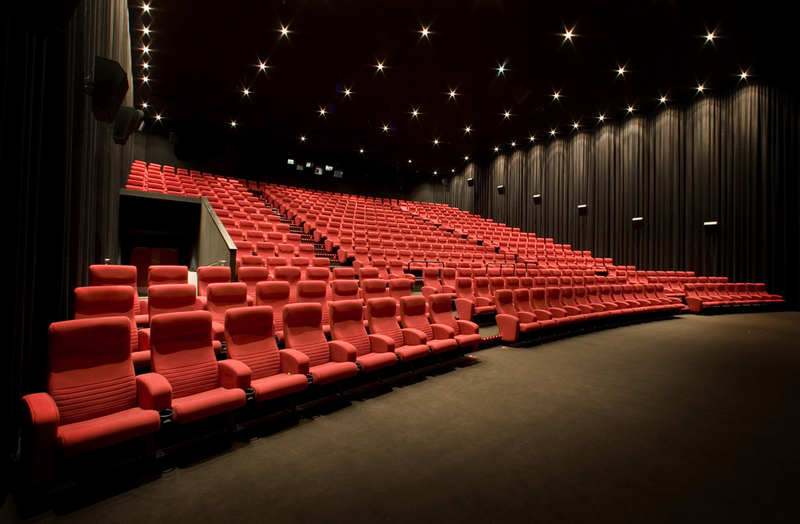 While the viability of the traditional cinema offer is constantly being questioned, cinema is still the undisputed queen of the mass media arts. Focus testing tells us everybody still goes to the movies. Corporate investment in cinema production is Pharaonic, the glamour and excitement; legendary and infectious. It is both a mirror and a record of the evolution of contemporary urban life. With this project we wanted to respond spatially to the opportunities generated by the burgeoning presence of digital space. We have sought to explore or identify in-between spaces where people can interact with digital space and narratives, of which cinema is just one example. It has seemed to us that the digital environment and the physical one are evolving in parallel yet strangely disconnected ways. The interface in digital parlance is only understood as the Graphical User Interface not the space the user must inhabit to connect to the digital domain. We have sought to address the social, psychological, physiological and haptic dimensions of this connection.